Who doesn’t love burgers and fries? So why not eat a healthy version? This meal satisfies that craving with less fat and more nutrients than a typical burger and fries. For example, the steak fries are baked, reducing the fat. The burgers are made from lean turkey, not beef. And for extra nutrients, the toppings include avocado and spinach. For those of us who love spices, add jalapeños, mustard, and onion for a bit more zing! Turkey Burger: Place the ground turkey into a bowl and pour 2-3 tbsp Yoshida Sauce over meat, sprinkle with 1-2 tsp seasoning, and use your hands to mix together thoroughly. Form the meat into 2 patties and place on the hot griddle. Turn after browned, and continue to cook through, about 8-10 minutes. Create It: Put the Sandwich Thins into the toaster to warm or if there is room on the griddle heat next to the burgers after they have been turned. Spread mustard on both sides of the Sandwich Thin, and top the bread with the cooked turkey patty. 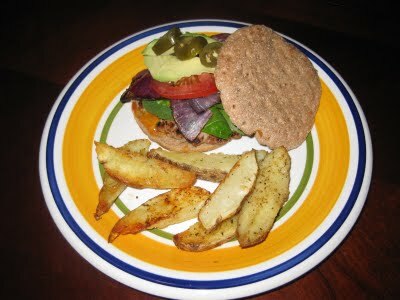 Start layering your burger with the toppings: Baby spinach, sliced onion, tomato, avocado, and end with the jalapenos. This is a messy burger so be prepared with a fork on the side.